The Wilmington-Clinton County Chamber of Commerce celebrated the opening of The Print Shop at 61 E. Main St., Suite 3, on April 2. With a ribbon-cutting, coffee, donuts and goodie bags, the event was a perfect opportunity for Wilmington residents to learn more about The Print Shop, its services, and its two other locations in Hillsboro and Washington Court House. The company’s services include printing multi-part forms, envelopes, and business cards to installing window and vehicle decals to printing and coordinating direct mail pieces. Visitors to the opening met Daniels as well as Ross Stadt, Branch Manager, and Savannah Morris, Designer. 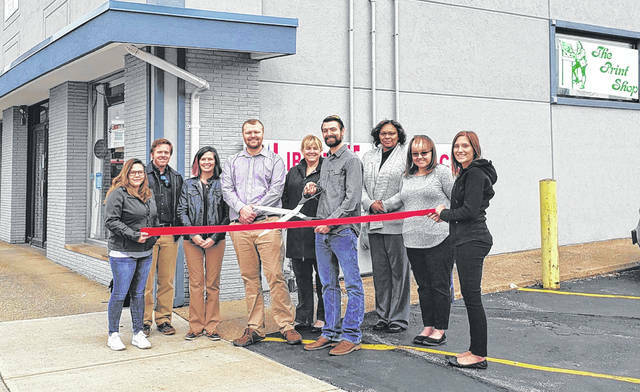 “As an established business in Fayette and Highland Counties, we’re thrilled to welcome The Print Shop to Clinton County,” added Dessie Rogers, Executive Director of the Wilmington-Clinton County Chamber of Commerce.